Leading global logistics provider Expolanka Freight Ltd. (EFL) won the award for Highest Foreign Exchange Earner – Logistics Services at the recently held Presidential Export Awards 2017/2018. 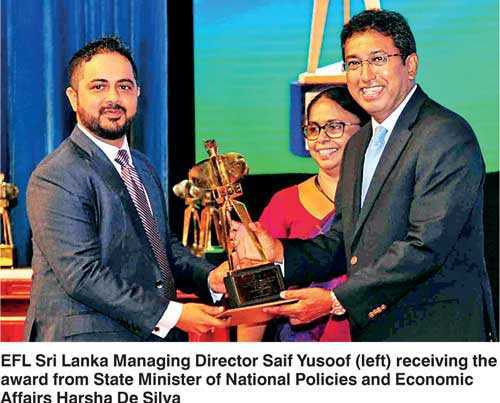 The awards ceremony, organised by the Sri Lanka Export Development Board (EDB) for the 22nd year running, saw a number of exporters being recognised for their excellence in performance for the financial year that ended 31 March 2018. The ceremony was held under the patronage of President Maithripala Sirisena at the BMICH, Colombo, on 18 September. Evaluations for the award category won by EFL was based on foreign exchange earnings of the logistics companies that had applied in the financial year under review. According to the EDB, the Export Awards is organised annually with the objective of recognising the efforts of the Sri Lankan exporters and their contribution towards the development of exports and the national economy. Speaking to the media on the award, EFL Sri Lanka Managing Director Saif Yusoof said the Company was proud of the part it continues to play in developing Sri Lanka. “We are pleased with the recognition bestowed upon us by the EDB for our performance. Although we don’t set out to win awards, we always strive to go beyond our own projections and we keep setting the bar higher and higher, not just for ourselves but for the industry. It is gratifying to end the year on a high note, and we›re proud of our contribution to the country’s economy in terms of much needed foreign exchange earnings. My sincere thanks go to all staff and stakeholders of EFL who made this success possible,» he said. Winners and nominees for the Presidential Export Awards were selected by a panel of eminent individuals headed by a retired High Court judge. Initiated by the EDB in 1981 by then Minister Lalith Athulathmudali, the Presidential Export Awards presents some 59 awards, comprising 11 overall awards and 48 sectoral awards, one of which is for logistics services. Speaking to the media recently, EDB Chairperson Indira Malwatte explained why the Export Awards are highly coveted among exporters. “There are many different export award schemes in the country, but PEA is the one that every exporter is looking for. This not only encourages the higher management of the company, but it also gives pride and recognition to the entire staff,” she said. EFL is a member of Expolanka PLC – a leading conglomerate with interests in logistics, leisure and investments. The Company has thrived on overcoming the challenges of operating in limited logistic infrastructure markets, taking its operations to 18 countries, 60+ offices and over 2,300 staff around the world.